error You can see some generic examples below and you can reach out to us here for more specific examples or any other questions. With chatbots, be available 24/7 to your users and visitors. Now, your sales and customer service teams can focus on more complex tasks while the chatbot guides people down the funnel. Capture your visitors’ lead info and ask them followup questions like "How many people work at your company?" to help your sales team get more info about the prospect. Build your visitors’ persona and find key patterns by analyzing and segmenting chatbot data by demographics, user responses etc. Take your business to the next level by integrating the chatbot with your sales, marketing and service tools. Looking to optimize your chatbots for best results? What better place to start than to read up on all the best practices for chatbots! Chatbots are the present and future of digital marketing. If you still haven't made a chatbot or looking to improve one here's some inspiration. 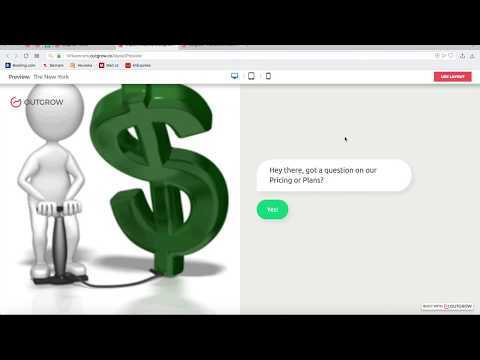 In this video we take a look at how you can make (and embed) a chatbot for the pricing page of your website. If you are an A+ marketer, you will love this beast! It looks simple but the intelligence you get out of it is incredible. Makes generation of qualified leads a lot easier and even fun. A lot of thought has gone into building this piece of software. For sure. Such a great idea for conversion rate optimization on landing pages! These are the benefits that I found were great for us: - When you've maximized good quality traffic, this is a great idea to optimize conversion rates on your landing pages - When used intelligently, visual content mixed with calculators and quizzes leads to better engagement and completion rates - Integrates with most important tools out there. Great calculator quiz building tool with various field types and well-designed modern templates. The resources section and support is great too. Very happy with the software. You can't beat outgrow for creating advanced quizzes that help you generate leads. It's like the facebook quizzes we used to do for fun, but now you can use them to generate top quality leads for your business. If you do some thinking, you'd be shocked how many different quizzes you can come up with. Super customisable and easy to use, would definitely recommend checking it out! These guys are so cool! Their product is fun and easy to use and obviously developed by a team of creative geniuses that care about their customers. The next generation of content marketing This software is extremely agile and allows us to build any type of calculator or quiz we can imagine. This is one of the best options out there to create engaging content, especially in a time when blog posts are being dull. Such a great idea for conversion rate optimization Pros: - When you've maximized good quality traffic, this is a great idea to optimize conversion rates on your landing pages - When used intelligently, visual content mixed with calculators and quizzes leads to better engagement and completion rates - Integrates with most important tools out there Cons: - Wish there was more visual mapping for different outcomes, but I am confident this will be available in the near future. You can't beat Outgrow for quizzes Pros: You can't beat Outgrow for creating advanced quizzes that help you generate leads. It's like the facebook quizzes we used to do for fun, but now you can use them to generate top quality leads for your business. Highly recommend testing it out. Cons: It can be a little expensive (especially if you want the more advanced features), but if you're using it properly it'll pay for itself in no time. Easy to Set-up, Great Converter Pros: Converting visitors to leads at a rate of 10x vs. not using Outgrow. Further, we're dropping these leads into a drip campaign specific to the results of their quiz. Cons: Cosmetically the tempalte we are using has shadows. Outgrow was quick to suggest an alternative template. Outgrow is on to having a great product! Pros: I love that I can build a quiz in minutes. I love that I can mix different types of questions: Multiple choice, open ended, or select all that apply. Cons: I would like more page editing features rather than to depend on templates. Also, when I want to embed the Quiz on one of my pages I cannot (I don't know CSS or am a programmer) change the background color of the Quiz to reflect my site colors. This would be nice to do. I hear the new version coming out may solve this... Overall: Quizzes are the future of internet marketing. People love quizzes and they help you build a relationship with someone easier. If you don't use quizzes you are missing a great tool to market your products. Pros: The Outgrow software is something I have been looking for in the market for a long time. However, I could only find unglamorous, 'ugly' designs and bad user interfaces.... Then, I found Outgrow. Outgrow provide a really easy solution to the problems of marketing and engaging with consumers in 2017. The team are a really dedicated support who get back to you within a few minutes on live chat. Cons: Nothing. Everything is great. I would like to see more features being added though, to add even more value, but otherwise really great! Overall: Being able to really engage with my consumers and give them fun ways to know more about my brand. The next generation of content marketing Pros: This software is extremely agile and allows us to build any type of calculator or quiz we can imagine. This is one of the best options out there to create engaging content, especially in a time when blog posts are being dull. Cons: I wish the lead generation module was more agile in terms of placement. Also I would like to see an advanced drag and drop editor. Overall: Generate more leads. Capture the attention of my customers and build goodwill with great content. I think these quizzes are fabulous! I can do a variety of quizzes to intrigue my blog readers, and make different ones to fit the need at that time. Sometimes humorous, serious, or simply interesting. I love the social share so once the reader gets their outcome, they can share on social media. Also, it can take them back directly to my website. Outgrow is the gamification of online customer engagement, a conversion machine that improves the experience of our visitors. At Bazaar10X.com we track the most effective growth strategies and Outgrow comes at the top of our list for online marketing and customer engagement. Their platform is flexible, easy to use and fully customizable making every experience unique and relevant to our target audience. We use Outgrow to drive conversion, add value or educate our audience and to pre-qualify leads. The follow-up process for our leads is much more targetted with Outgrow because we already collected key information to make the content and value proposition more relevant. We collect more leads with more relevant info. I term of SEO, the platform includes all the bells and whistles to rank and it can be used both as a standalone landing page or embedded on a website. All and all relly impressed with Outgrow, right now at the centre of our online engagement strategy. Outgrow is best thought of as a very powerful calculator. Imagine a very intelligent person sitting across from you with a computer asking questions, calculating results, and feeding the results back to you in an easy-to-understand form. Outgrow is all of that and more. The best part about Outgrow is that it is equally useful for beginners and advanced users alike. You can get started creating simple calculators and quizzes in no time. You can make those calculators and quizzes gorgeous with little effort. You can do it in less than 15 minutes. But it doesn't stop there. The advanced calculation features allow you to design highly complex apps without needing to do any coding. The possibilities for lead magnets and premium products are infinite and exciting. I like to use my time to work on my business but tactical are just as important so being able to learn a piece of software in the shortest space of time make sense. But that's not all. I have used all sorts of software , from page builders, to trackers, to heatmappers, to webinars software. What impresses me most about Outgrow is that it delivers on it's promises. All functionalities work and the support turnaround is fast and personal. I find i am not wasting time waiting 2 months plus for bug fixes and poor excuses. When i have an issue or i am not sure about a particular function - i just send a chat ticket and invariably it gets answered with 40 minutes. Money likes speed and money is fuel for a business. I like things that work! This tool was so easy to use. We've tried other calculator tools but Outgrow had a variety of templates and designs as well as the flexibility of making our own formulated results. Plus the customer support team was extremely helpful in getting our calculator perfected before launch. Their customization was really great, their template selection was excellent as it let me customize my quiz exactly the way I wanted. Their drag and drip feature made it really easy for anyone in my team to be able to modify the quiz and customize it to our needs. At one point I had some questions about the platform and needed technical support, they were very helpful through the phone and were willing to work with me. The fact that the sales rep had researched my company prior to our call and gave us suggestions as to how to better implement Outgrow into our website to increase our leads was impressive. I don't think I've had a company do its research on a customer before jumping on a call. It also really helped in terms of context, since I avoided having to explain who we are and what we do. Love Outgrow as the marketing tool to get profile and health profiling of our customers. Getting to know our Health Bootcamp members well is critical as it enables us to customize the experience. Our success depends on how well we know the issues they are facing. Outgrow has great templates and branded designs as well as a very simple beautiful user experience. We have had 96% response rate using Outgrow Quiz. We've been using Outgrow to create interactive content for a range of clients. It's a great tool for creating interesting ways to add leads to the top of the funnel, whilst staying away from the overused free PDF guides, etc. The content builder is very easy to use, but extremely powerful. The scoring logic is really useful, especially the "if most answers are A, give the outcome X". There are a number of potential integrations, including to the most popular email marketing systems. The native integration with Active Campaign was perfect for our clients. Put simply - why will your audience leave - once they start interacting with an Outgrow calculator. Simply outstanding .. guys you have created an amazing engaging platform where the clients get massive value. Also 24 hrs support and simply superb. great to see a company investing in great platform but also on customer service ..
Love the easy function for building a Quiz and the ability for branding. Your new leads are coming! We have searched for this for a couple of years and now it´s here. Thanks, Outgrow! Fantastic software. Easy to use, meet needs and are enjoyable! The customer service is fast with high knowledge and flexible mindset. To fully meet our brand book, and tone of voice, there have to be more fonts. Such as Open Sans and top Google font family. Meet needs, easy to use and enjoyable! Great product for creating quizzes, surveys with viral power. Love the calculator option, we can create powerful assessments for our clients which calculate scores, then use that score to assign an assessment or gap value. Amazingly powerful. Support is great, really great, they always answer, always help with things we are doing even when it's a weird request. Not many cons, new features show up, but it's pretty powerful now. We've had a few growing pains as we learn to create assessments and quizzes, but support has helped us through them. Is Your Content Marketing Worth All The Effort? Consult Our 10 Point Checklist.